Are you interested in cluster rings? Find out what makes cluster rings so unique and why they’ve been so treasured over the past few hundred years. Cluster rings have been about for as long as craftsmen have been setting precious stones in metal or other materials. Their use as engagement rings is a more recent phenomenon. 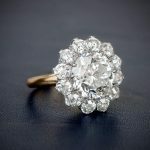 Many attribute the rise in popularity to the fact that William gave Kate his mother’s cluster ring for their engagement. They believe that the royal family was the ones who kick-started the engagement cluster trend. This is not entirely true. Engagement rings have been in common use for centuries. The earliest origins go back to pre-roman times when men would put a ring on a woman’s finger to indicate “ownership”. As the jewelry skills developed enough to create gemstones rings, the more gems that were shown, the more prestigious the ring. A single stone ring would have been uncommon. 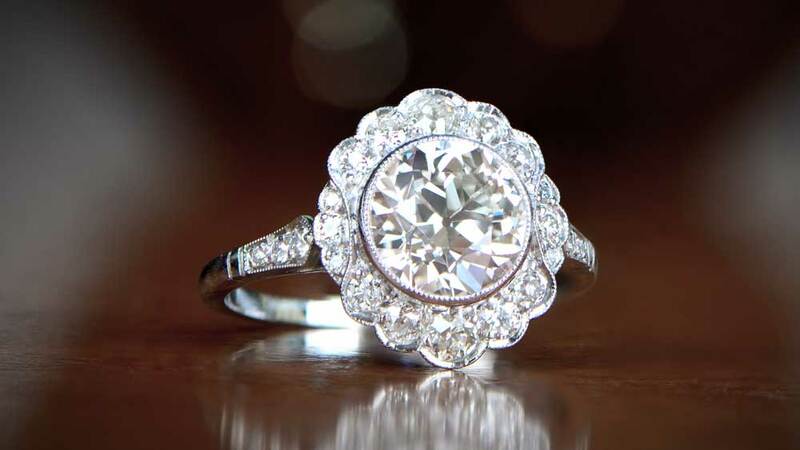 It was really only when the Tiffany Setting style of diamond rings was launched with huge success that we saw solitaire rings become the accepted norm as a signal of intent to marry, and the cluster style became a more niche choice among discerning buyers. 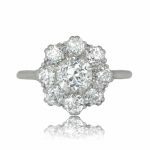 A cluster ring features a primary diamond in the center that is surrounded by a circular halo of smaller diamonds. 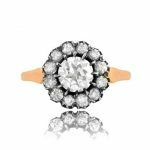 Technically, any ring with a halo of diamonds can be classed as a cluster but, traditionally, the outer pattern needs to follow the shape of the smaller diamonds in order to truly be a cluster ring. Although in recent times cluster rings tend to describe only engagement rings, it can technically refer to cocktail rings as well. In ages past, each culture would use stones relevant to their beliefs to decorate the rings, with emphasis placed on precious and bright stones such as rubies or emeralds, and diamonds took more of a back seat, being seen as a sparkling addition rather than being the star of the piece. Indeed, it was only in the late 1930s when De Beers launched their famous advertising campaign, that the engagement ring as we know it today took shape. It’s fair to say that most colored stones look amazing with diamonds as part of a cluster arrangement, which may be why Princess Diana’s ring on Kate’s finger was an instant hit. Put a beautiful ring on a beautiful woman and there’s no end to the impact it can have. For most of the cluster ring renaissance, though, the clusters themselves have predominantly been entirely diamond based. This is not just because of the obvious beauty a diamond cluster has, but also for more pragmatic reasons. An example of a cluster ring. Available for purchase here. In solitaire rings, it will take a very special stone to bring gasps of admiration for anybody who sees it. With cluster rings, the headliner needn’t necessarily be as big or as expensive. The added stones play the role of supporting-artist and do wonders for the general beauty of the ring. This doesn’t mean that diamond cluster rings are inferior in any way, of course. Most clusters will have a total carat weight well in excess of most solitaire rings. The cost is tempered, however, in comparison to what is charged for a single diamond. To understand more about carat weight works, click here. Jewelry, like many aspects of the fashion world, goes in cycles, and we’re seeing this with cluster rings today and the fact that neither diamond nor multi-stone rings really dominate. The benefits for us all is that we’re not restricted to any one particular style or influence in any defined period. We get the best of all worlds. Designers can dare to be different knowing that they have a global marketplace with global advertising at their disposal. Cluster rings are truly beautiful things. Add a dash of color with a ruby or sapphire and it can go to yet a whole new level. 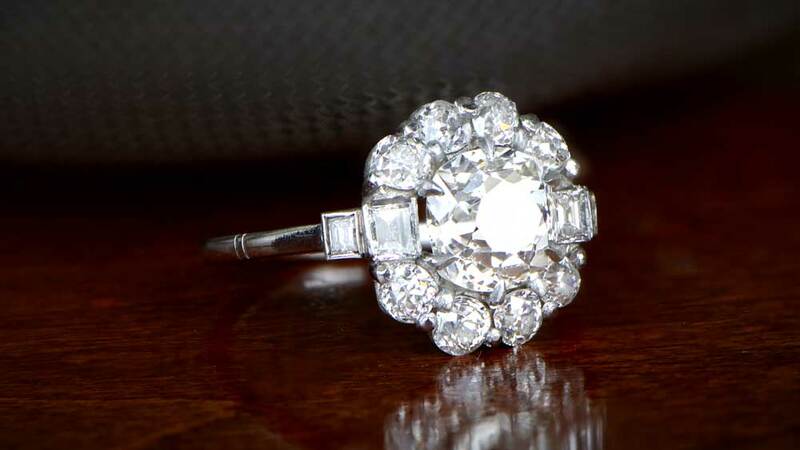 Find an Art Deco Cluster Ring, and you may be looking at a ring that will appreciate in value. Cluster rings are truly for the ages.